The mysterious present was hard to miss, placed prominently up on a pedestal table next to the fireplace. Wrapped in gold cloth, banded with a red velvet ribbon and bow, it was oddly shaped, nearly like the size of a thick book, yet a round protrusion on top suggested it was nothing that simple. There was no indication of who the present was from, nor who it was for. 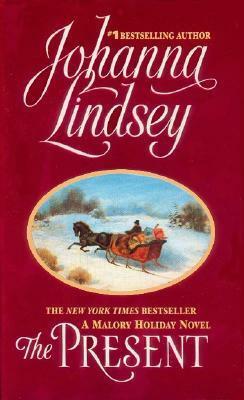 The remarkable JOHANNA LINDSEY brings together her most beloved creations -- the incorrigible, incomparable Malorys -- for a joyous celebration of passion, tenderness, surprise, wonder, and love in a Christmas story you will never forget. As the entire Malory family gathers at Haverston to celebrate the season, all is not well. Underlying tensions threaten to dampen the holidays spirit -- until a mysterious present that arrives anonymously is opened and shared by all. The gift is an old journal -- a tender and tempestuous account of the love affair between the second Marquis, Christopher Malory, and a dark gypsy beauty named Anastasia, who seeks a love match with a non-gypsy in order to save herself from a prearranged marriage to a brute. Though the dashing English lord Anastasia sets her sights upon burns for the exquisite, exotic miss, Christopher could never consent to wed such a lowborn lady. But miracles have been known to happen in this season of peace and giving and love, as two extraordinary people separated by circumstance of birth begin a passionate dance of will and wiles. And in the miraculous blossoming of a resplendent romance at a long ago Christmastime, there are wise and well-learned lessons that will enrich the hearts of the Malory descendants -- and, indeed, of everyone who has ever dreamed. Open and discover a special gift of love this holiday season. delightful, warmhearted treat...I loved it. Thanks Ms. Lindsey".